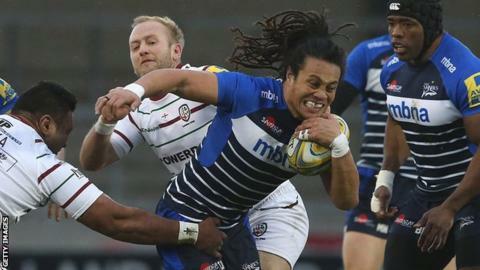 Sale Sharks scored four unanswered second-half tries against Premiership strugglers London Irish to maintain their unbeaten home record this season. Tries from Brian Mujati and TJ Ioane put Sale 12-10 up at the break, with Shane Geraghty kicking seven points for Irish, including converting a penalty try, in blustery conditions. Sam James went over for Sale's third score within a minute of the restart. A pair of Nev Edwards tries and Sam Tuitupou's effort ensured an easy win. Both sides returned to domestic action having secured their progress in the European Challenge Cup with victories last week. Sale forward Josh Beaumont, the only Sharks player called up by England for the Six Nations, took his place in the starting XV at the AJ Bell Stadium, having been released from Eddie Jones' national squad for the Premiership clash against the Exiles. In difficult kicking conditions in Greater Manchester, Geraghty landed the first points of the game for a London Irish side that made 11 changes for the league fixture, before Mujati snuck over in the corner to edge Sale ahead soon after. Danny Cipriani's conversion fell short in the strong wind, but he slotted his second attempt after Ioane scored when the Exiles' defence crumpled on the line trying to resist Sale's pack. Both teams struggled to keep possession as the rain got heavier, but Will Lloyd went close to responding when he knocked on over the line, before Irish hit back with a penalty try two minutes before half-time. London Irish lost their grip on the contest immediately after the interval, losing their own line-out to allow Tuitupou to break away and feed James, who crossed from close range. Edwards then grabbed two tries in six minutes and Tuitupou crashed over as Sale ran away with victory. "I thought we handled the conditions and the elements really well and we probably left two or three tries out there. "What we've got is a good team spirit and we are sticking to the plan. "Right now we are putting teams away which is good and converting what we do in practice into a game day. "What we we can't do is get too cocky as we've got to go to Leicester next week, but I've told the players to enjoy the rest of the weekend." "We worked our way back into that game reasonably well in the first half. I just don't think we came out with the desire or the grit that was going to get us to the end. "We're always going to have to roll our sleeves up and play hard in those conditions and we failed to do that. "I was more disappointed. Frustration would've come into it if we had been in an arm wrestle in the second half, but it certainly wasn't that. "Sale were far too good for us second half. We've got to be much better than we were in the second period today for sure." Sale: Haley; Addison, James, Tuitupou, Edwards; Cipriani, Stringer; Lewis-Roberts, Taylor, Mujati, Evans, Ostrikov, Ioane, Seymour (capt), Beaumont. Replacements: Briggs, Harrison, V Cobilas, Mills, Neild, Cusiter, Ford, Arscott. London Irish: Maitland; Ojo, Hearn, Williams, Tikoirotuma; Geraghty, McKibbin; Court, Paice, Aulika, Symons (capt), Lloyd, Treviranus, Gilsenan, Narraway. Replacements: Ellis, Harris, Halavatau, Sinclair, McCusker, Steele, Brophy Clews, Fenby.